I am having SO much trouble getting the menus just right. Please bear with me. I decided this week to add brief bios on two other dragons: the Mother of Devidhyaan, and the Master of Lalika. The Mother is an ally, friend, and sometimes mate of Bhanu’s. Janesh, Master of Lalika, is their bitterest enemy, responsible for the deaths of both their mothers. You can read more about Mother here. And more about Janesh Lalika here. The dynamic between these three individuals drives much of the political scene on the continent. 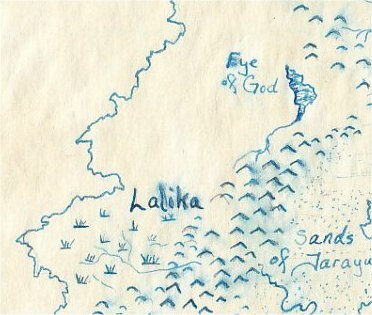 This week’s featured image shows Devidhyaan, which means “Eye of God”, Lalika, and the west of Jarayu.